I’m sure everyone has experienced this at some point: you start reading a book you’ve heard great things about, or have wanted to read for a long time only to get partway through it and find that it is not nearly as good as you thought it would be, and it is near impossible to get immersed in it. So what do you do? Many people I know, both avid readers and not, abandon the book, with the logic of “why waste time reading a book you aren’t enjoying when you could switch to a book you’d like better?” That logic makes perfect sense to me but ever the optimist, I like to persevere, thinking that eventually the book will get better. And, if it doesn’t, well then at least I know how the story ends. 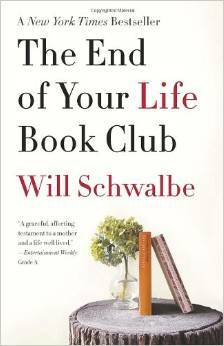 But with Will Schwalbe’s The End of Your Life Book Club, the book I had picked to read for Books On The Nightstand’s summer book bingo under the category of a book with only words on the cover, I quit partway through. The gist of the plot is that Will Schwalbe’s mother is diagnosed with pancreatic cancer, and he and her end up creating an impromptu two-member book club. They recommend books to one another, and discuss them during his mother’s chemo treatments. The story is incredible, but the writing style is so far from what I like reading that it dulled the story for me to the point where I was counting the number of pages left before the next chapter began. While I have stopped reading it for now, I wrote a post-it note with the title of the book and the page number I got to and stuck it on my bookshelf so that I can always go back and try it again. 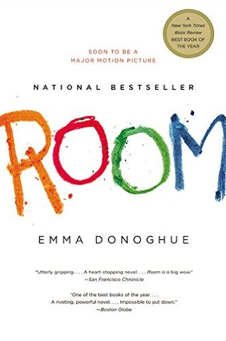 In order to fill the gap of a book with only words on the cover, I substituted in Room by Emma Donohue, which I mentioned in my Pre-Paris book haul. I read it over the course of my trip, finishing it just yesterday on the plane home, so expect to see a review of that one soon. It is an incredibly powerful novel, and one that I would have read in one sitting if I could have, but the plane ride over wasn’t long enough. So, my question of the day is what book did you start reading but didn’t finish??? I have to read Midnight’s Children by Rushdie for my Literature degree, and I really can’t get into it. There are so many books other people have loved that I REALLY didn’t, like Twilight Saga. I think I got about 4 chapters into the first one before deciding it was not for me! I haven’t given that one a go yet. Hope you get into it though!!! Sometimes books for school are the hardest to read. You’re always looking for themes and symbolism and such. And ah yes, twilight. I was the same with it. I wanted to like it but I just couldn’t see the appeal. I mean, both a vampire and a werewolf could kill you. Not exactly alluring. I read to the last 100 pages of David Copperfield waiting for anything exciting to happen (on principle) then one day I just had enough and never picked it up again! That is a pretty big read. Movie adaptations usually help me get back into books like that. I want to know what the screenwriter changed. Otherwise, at least I know how the story ends, plus I get some popcorn out of it. Haha the popcorn is key. I read it right after great expectations. Which is now my favourite dickens book. Oh that is a good one!!! I once started a John Grisham, thought that I had read it before, then changed my mind and thought it was new to me. Changed my mind again backwards and forwards over the next few pages then realised I didn’t care about it either way so gave it up! Good post. Haha that happens to me a lot too. Especially when they start changing covers so the book looks completely different.